​Think about it. At some point every day, everyone is a pedestrian. Whether you are crossing the street to work or traveling through a parking lot on your way into the store, you are a pedestrian. 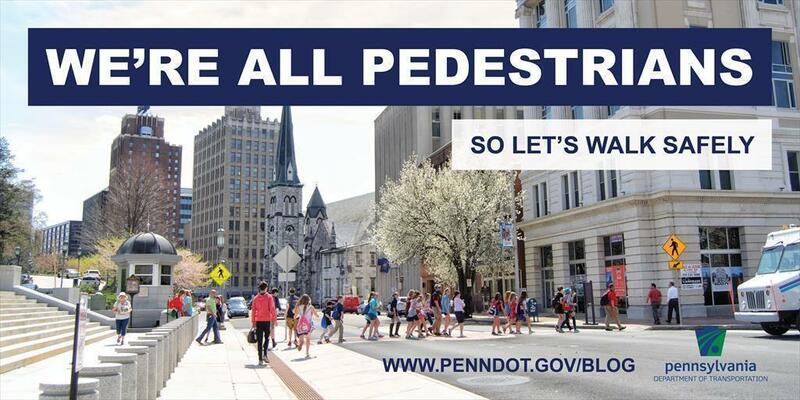 Unfortunately, in Pennsylvania, pedestrian deaths have gone up* — there were 172 in 2016 compared to 153 in 2015. The rights and duties of pedestrians vary greatly depending on the situation. It's important to familiarize yourself with Pennsylvania laws, as well as common-sense safety tips. LAW: Walk on sidewalks whenever they are available. If no sidewalk is available, you must walk on the left side of the road, facing traffic. TIP: Never assume a driver sees you. Make eye contact with drivers as they approach you to make sure you are seen. LAW: Motorists must yield to pedestrians crossing the street at marked and unmarked intersections BUT the pedestrian must either be within the crosswalk or affirmatively indicate an intent to cross. TIP: Be visible at all times. Wear reflective materials, apply reflective tape, or use a flashlight at night. TIP: Cross streets at crosswalks or intersections whenever possible. LAW: Pedestrians shall not suddenly leave a curb or other place of safety and walk or run into the path of a vehicle which is so close as to constitute a hazard. TIP: Keep alert at all times. That means putting away your electronic devices so you can stay focused on the road. The onus of safety doesn't rely solely on the pedestrian. As a motorist – especially in densely populated areas – it's important to always be aware of your surroundings. Use extra caution when driving in hard-to-see condition, such as nighttime or in bad weather. It's illegal to pass vehicles stopped at a crosswalk. There may be people crossing that you can't see. Slow down and pay attention when approaching or turning at a crosswalk. If you are turning right at an intersection, and the pedestrian has a lit WALK signal, the pedestrian has the right of way. Don't engage in distracted driving. Taking your eyes off the road, your hands off the wheel, or your mind off driving can have deadly consequences; a person engaged in distracted driving is up to four times more likely to be involved in a collision. October is Walk to School Month, and Oct. 4 is Walk to School day. Learn more about schools around the state participating in the event, as well as ways you can teach children pedestrian safety. Pennsylvania also participates in the national Safe Routes to School program, which helps create safe, convenient, and healthy opportunities for children to walk and bicycle to school. Follow PennDOT on social media for more safety tips. We're on Facebook, Twitter, and Instagram. Test your pedestrian safety knowledge with our quiz on Facebook​.